CNN correspondent, Tom Foreman, will moderate the debate which will feature over 70 members of the media, including ABC and NBC. Over 10,000 churches, schools and colleges are expected to watch the debate over the internet. Bill Nye has repeatedly mocked and ridiculed those who believe in the Genesis account of our origins and anyone who doesn’t believe in evolution as he does. He claims that those who don’t believe in evolution hold “everybody back”, and that “Your whole world is just gonna be a mystery”. He’s also claimed that evolutionists need our kids, and he’s doing his part to indoctrinate as many into believing evolution as possible. After spending much time in discussion, Bill Nye has finally agreed to a debate, and evolutionists have been extremely vexed that he has done so. There’s no secret that evolutionists have a completely one-sided monopoly on the origin of man and the universe, and they don’t want to relinquish that hold. They own the public schools and colleges and can promote evolution with little to no opposition thanks to court rulings that have prohibited the teaching of creation science and attempting to ban any discussion that is critical of evolution. Of course the United States Constitution prohibits laws prohibiting the free exercise of our religious beliefs, but somehow the court system has managed to violate that without any repercussions. If creationism can better explain our origins, then there should be no law prohibiting truth, and no laws preventing students from making up their own minds. After all, that’s at the very heart of what an education is about… academic freedom and the ability of students to learn how to think, rather than be taught what to think and believe. Evolutionists are upset because they don’t want creation science to receive any attention or notoriety, and they certainly don’t want anyone to think that creation is a legitimate option. They fear that debating creationists is a losing proposition and doesn’t do them any good. Doing so would only lend credibility to creation, and they’re adamantly opposed to that. In addition to all these fears, they also know that creationists typically win debates against evolutionists. So this is a great opportunity for the public to learn how creation science supports God’s Word and offers good, sound science. Here are some quotes from around the media. Well said. Good post. Thank you. I really don’t know where this kind of victim mentality comes from, honestly. According to the latest Gallop polls, only 15% of Americans believe that humans evolved with absolutely no help from God. 46% believe that God created humans in our present form (the creationist viewpoint). And 32% believe that humans evolved, but that God had a hand in everything. I really don’t understand how you can be so theatrical when creationists outnumber evolutionists 3:1, and 5:1 once you throw in the intelligent design folks. The numbers would seem to suggest that it is in fact the creationists and the religious who have the monopoly on the narrative; wholly 78% of Americans believe that God created human life in some way or another. But more to the point, as an evolutionist, I welcome the discussion of creation science in the public. But I have to wonder if such a plan won’t backfire in the long run for creationists. When I ask most atheists I meet when the moment they became an atheist was, they usually respond, “when I sat down and actually read the bible.” Perhaps such aggressive promotion of creation science will have a similar effect. I wouldn’t call this a “victim” mentality, although I do think it’s an injustice. I’d call it a reality that we must face and deal with. The ACLU jumps on anyone who tries to promote creation science in the classroom or wishes to be critical of evolution. Look at the Kitzmiller vs. Dover trial for example. In some cases students are failed or threatened with failure if they present creationist arguments as fact. Dr. Michael Dini, biology professor at Texas Tech, tells students that creationists will not receive recommendations from him, and the college backed him up. Professor Lesley Northup at Honors College says that anyone believing in creationism should not be allowed to graduate. Dave Jolly had professors at Arizona State University tell him that if he challenged evolution once more they’d throw him out of class and fail him. Other students have been told that they may not provide evidence for the Bible or Qur’an being scientifically accurate if they want to pass exams. Further examples of discrimination have been provided in Richard Sternberg, Guillermo Gonzalez, Robert Marks, Jerry Bergman, Michael Polany, Francis Beckwith, Marcus Ross, Andy McIntosh, Caroline Crocker and Mark Armatage. Yet I do find it ironic and very interesting that Darwinian evolution, while a minority among most Americans, wields great power. And those in power are extremely vocal and politically active, and they’re abusing that power without repercussion. I think that’s because the nature of politics can sway public opinion and certain sectors, such as the judicial branch, academia and elites. Once it becomes ingrained that there’s an acceptable way to think, those who wish to be “respectable” have a tendency to be swayed by political correctness. Thus they side with those who claim that evolution is a fact- or that manmade global warming is agreed upon by all scientists, without even understanding any of it themselves. According to some scientists evolution must not be questioned, and anyone who wants to be accepted must toe the line or be ostracized. This is a complex issue, but I think it’s rooted in politics, philosophy and groupthink. I’m glad you’re open to discussion of creation science in the public, but I’d guess you’re in the minority of evolutionists. As a Christian, I’m really not worried about the debate backfiring. God’s in control either way, so it doesn’t make sense to worry. We just need to do the work God is calling us to do, regardless, and let him change people’s hearts and minds in his own timing. Yeah, I’ve heard such quotes about reading the Bible before, but I really think it derives from ignorance. It’s not surprising that someone who’s never read the Bible before won’t believe the Bible, especially if they’re prone to accept evolution and whatever they’ve been taught in science class without question and without critical thinking. I think the lack of critical thinking skills is one of those problems. Most people don’t examine the Bible’s claims as closely as someone like Josh McDowell, a staunch atheist who became a Christian while trying to disprove the Bible. It’s not like these people really want to know if the Bible is the inspired word of God. I guess I find it hard to believe that atheists and evolutionist wield any political power. As far as I’m aware, there isn’t a single publicly “out” atheist in congress or on the Supreme Court, and there are extremely vocal creationists in the House of Representatives. And even if there were closet evolutionists in congress or the Supreme Court, with the numbers from that poll it would be political suicide to act against the clear majority of the country. Yeah, but look at the media responses when a Republican politician mentions laws about intelligent design or creation. The outcry against it is astonishing. There aren’t any current members of congress who profess atheism, however there’s about 27 members who are atheists according to Herb Silverman, but they’re hiding in the closet. The retired Barney Frank and Pete Stark were atheists, but they didn’t admit that until after they retired. Doesn’t make much sense. I get why they don’t admit it; they’d be alienating 78% of the electorate at that point lol. I do see your point about the outcry, and I think it’s a fair one. However, to me at least, my problem isn’t necessarily what they believe so much as letting it spill over into legislation. I don’t even really care whether or not it affects their voting; if we all vote with our conscience, then the religious man or woman will undoubtedly call upon that when voting for a candidate or a piece of legislation, whether that person is an ordinary citizen or a government representative. I’m a firm believer in the separation of church and state. Unlike Nye and Dawkins, I don’t have a problem with people learning creationism. People should be free to learn about whatever they want. People lose and gain faith everyday, and it isn’t my job to try and influence that. I don’t much care for creationism in the science classroom. If schools offered education about creation at all, I’d rather see it in a philosophy class or something of the sort, and even then I don’t think it should be limited to only the Christian narrative; if you’re going to do it, go all the way and equally represent all the major religions. I have faith (no pun intended) that people will naturally gravitate toward whatever makes the most sense to them, regardless of whatever indoctrination they receive. It happen to me, after all. And I know people for whom the reverse is true; they were brought up in agnostic or atheist households and found religion later in life. Put as for politics, I prefer to keep religion out of legislation. There’s a reason why we don’t have an official national religion, and the first amendment is pretty clear, at least to me, about the government trying to legislate religious matters. After all, it isn’t a government mandate that schools teach evolution, that’s a decision made at the district and board level. I know there are states like Kansas and Texas who are doing their own thing regarding creationism, and that’s up to them. Any atheists or agnostics are free to move or send their children to private school, I suppose. 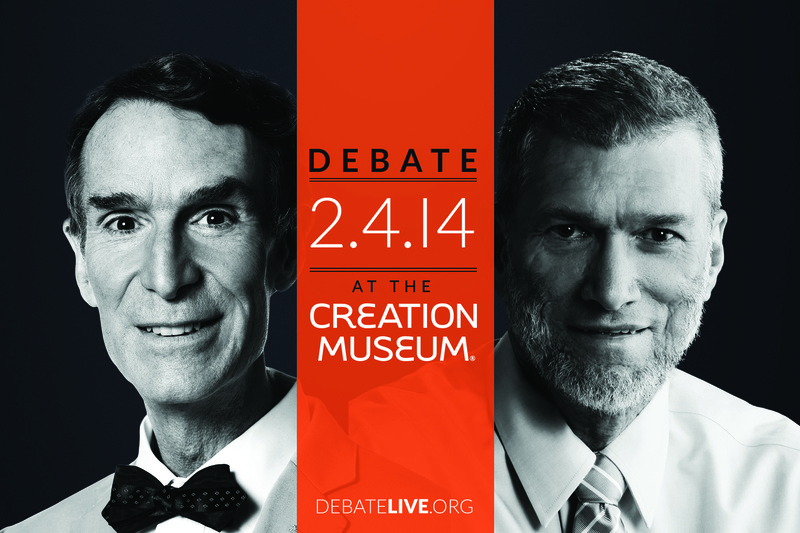 I would love to see a debate between say Tim Keller (Theistic Evolution) and someone like Ken Ham. I believe that debate would be much more interesting for Christians. Yes, I agree. I did write on a debate between theistic evolutionist Karl Giberson and creationist Randy Guliuzza. I thought Guliuzza had a much stronger performance both theologically and scientifically.